The Photography Show, the UK's biggest and best photographic event, attracted thousands of enthusiast photographers over the past four days, and Digital Camera World was there to join in all the fun. Here are our highlights. Canon had its very latest EOS M50 on its stand, and it was a lot smaller than we were expecting. This latest model packs 4K video and a 24MP APS-C sensor – and you can read more about it here. As always, the company also had a selection of its L-series optics for people to play with, each mounted on a sample of its pro-level EOS-1D X Mark II. Perhaps most interestingly, the company also showed off a few concept cameras, which were first spotted at CES earlier in the year. One of these could be mounted on top of a DSLR and was capable of automatic movement and picture-taking, using facial recognition to know when to capture images. Another model physically connected itself to a smartphone, much like the DxO One model. Over on the other side of the hall, Nikon had a number of samples of its latest D850 DSLR on display, and its stand was unsurprisingly busy at all times. You can read our review of the D850 here. 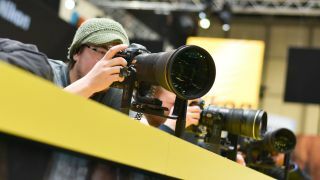 The company also took the show as an opportunity to show off its latest AF-S Nikkor 180-400mm f/4E TC1.4 FL ED VR. More on that lens here. Speakers on its Nikon School Stage included Game Of Thrones stills photographer Helen Sloan, as well as automotive photographer Amy Shore (above) and wildlife photographer Richard Peters. Sigma, meanwhile, had a number of new lenses on show, one being the 70mm F2.8 DG Macro Art-series optic. Here it is mounted on the Canon EOS 5D Mark III body. It also had the new 14-24mm F2.8 DG HSM Art , together with the also-new 105mm f/1.4 DG HSM Art(above), the longest Art-series lens with an f/1.4 aperture. Fujifilm had heaps of new products to show off, including its latest X-H1 mirrorless camera. It also had a sample of the forthcoming Fujinon GF 250mm f/4 R LM OIS WR behind glass, a lens that's set to arrive later this year. The newest full-frame camera on the market, the Sony A7 III, was also on show at this year's event, alongside the recent A7R III and a multitude of lenses. Sony's APS-C users were also well catered for, with samples of the E 18-135mm F3.5-5.6 OSS that was announced at the start of the year on display. Here is the lens mounted on an A6500 body. Olympus was busy showing off its OM-D E-M1 Mark II and E-PL9 models, although it also devoted the central portion of its stand to a team of technicians, who were cleaning, repairing and checking Olympus kit brought to the show. Similarly, in addition to its new GH5S, GX9 and TZ200 models, Panasonic was generously offering free sensor and lens cleaning to G-series users. Ricoh Imaging, meanwhile, had samples of its new Pentax K-1 Mark II (above) to play with, alongside other stablemates such as the K-70 and K-P models. Over on the Lomography stand, the company had a selection of fetching lenses on show, including the new Nepture Convertible Art lenses and the New Petzval 85 Art Lens, in addition to the Daguerreotype Achromat 2.9/64 shown above. Lens manufacturer Tamron had samples of its new 70-210mm F4 Di VC USD and 28-75mm F/2.8 Di III RXD lenses on its stand, both lenses having only been confirmed a few weeks ago. ... in addition to its XEEN-branded lenses designed for videographers. Here's the XEEN 24mm T1.5 Cine Lens on a Canon C500. Chinese quadcopter specialist DJI, which owns a majority stake in Hasselblad, took this year's event as an opportunity to show off its M600 Pro drone and Hasselblad H6D-100c combination. Over at The Drone Zone, Techradar's Tom Anderson was one of many speakers showing people just what can be achieved with today's models. Lens manufacturer Venus Optics was also present with its Laowa-branded optics, demoing its new 25mm f/2.8 2.5-5X Ultra Macro lens and the quirky 24mm f/14 2:1 Relay Lens. The company has also spent the last few years developing many more conventional lenses for mirrorless models, such as the Laowa 15mm f/2 FE Zero-D, and one particularly handsome combination on display was a Fujifilm X-T20 and C Dreamer 9mm f2.8 (above). Bag manufacturer Billingham didn't have a stand at this year's show but its new Hadley Pro Small was on sale over at the Wex Photo Video stand. Here's the bag in one of its five finishes. This year's show also gave people to see the winning images from the Digital Camera Photographer of the Year and Young Photographer of the Year 2018 competition. For more details on The Photography Show, head over to the official site.